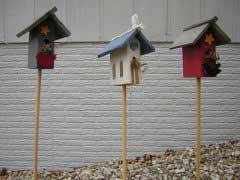 Return back to the Decorative Birdhouse page. 1 roof peak 5 1/2" long x 1/2"x1/2"
Saw 4 1/2" long piece of 2x4. Next, saw angles on 2x4 per drawing. Drill 1/2" hole in one end approximately half way between top and bottom. Also drill 3/8" hole in bottom for dowel rod. Install large nail 1/2" below 1/2" hole for perch. After making the 2 roof panels, install them with the finish nails on the angles at the top of the 2x4 with an even overhang front and back. Next, install the roof peak in the V that is formed by the roof panels with 1/2" overhang in front. Install 3/8" dowel rod in bottom hole. Paint and decorate to your liking. Church steeple is 1/2" square, installed with wood glue.